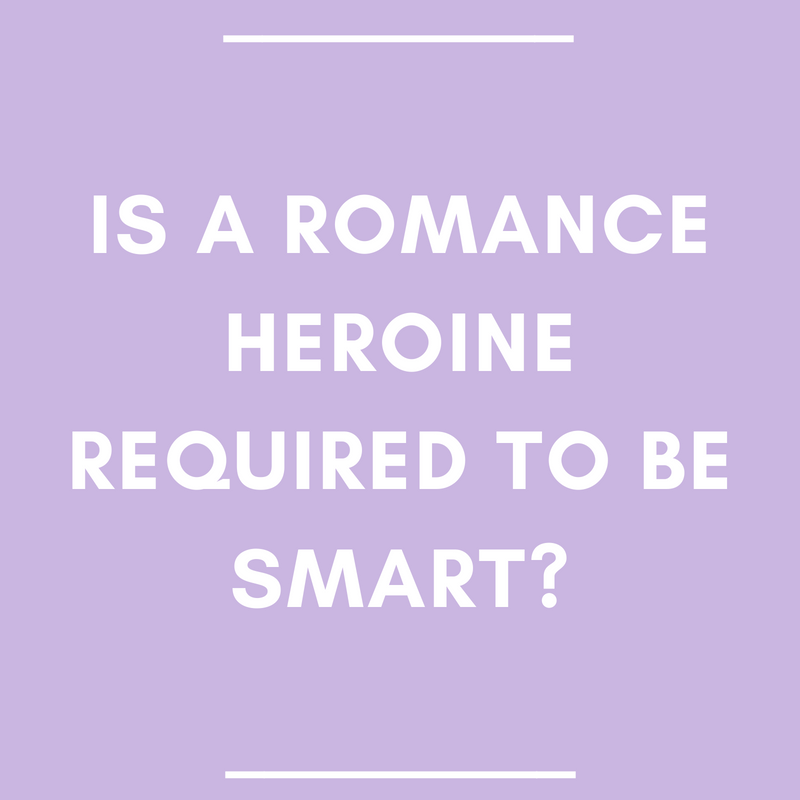 Is a Romance Heroine Required to be Smart? What is the most important quality of a romance heroine? 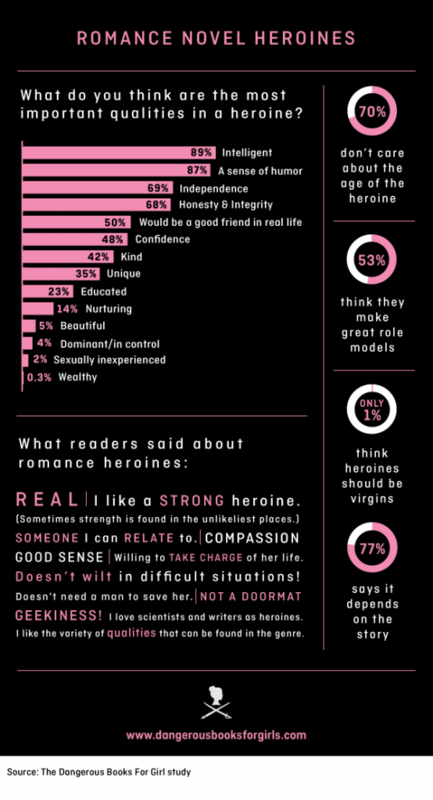 When Maya Rodale surveyed romance readers for her Dangerous Books for Girls study, a whopping 89% said the most important trait was intelligence. A sense of humor was a close second at 87% and independence came in third with a 69%. Why is a romance heroine expected to be smart? Decades ago, the heroine had to be uncommonly beautiful and exceptionally bright. She also had to possess a sweet disposition and, above all, she had to be virtuous. It was as if these attributes made her not just worthy of being the heroine of the story, but also worthy of love. A romance hero didn’t have to meet any of those requirements, but readers have always set a higher standard for the heroine. Gradually the feisty heroine became more popular than the sweet and obedient one. She no longer had to be a great beauty but most heroines are often considered attractive. And as the views of society changed, the virginal requirement faded with time. But, to this day, a romance heroine is still expected to be intelligent. Notice, I’m not saying educated. Education and intelligence are not the same. Like so many women in the past and present, there are heroines who don’t have the access, opportunity or inclination. And while there are more romance heroines these days with a learning disability or a neurological difference, that doesn’t mean they lack intelligence. As a writer, I like tweaking reader expectations. I have made a point of writing heroines who have never been accused of being sweet, beautiful or virginal. But I hadn’t touched the intelligence requirement until I wrote Outrageously Yours. I knew my heroine in this story didn’t like to attract attention. While I created her character, I decided she kept her head down because she had been diagnosed with a low IQ. She kept it a secret and compensated with grit and a strong work ethic. I knew this was going to be risky and I was so nervous that I didn’t even mention it in my story pitch to the editor. When I turned in the manuscript, I was sure I was going to remove the reasons for the heroine’s reticence and go through massive rewrites. But I didn’t have to change it! The editor was on board with my heroine’s back story and challenges. And I realized that a romance heroine’s level of intelligence doesn’t matter. What the reader really wants to know is if the heroine is evenly matched with the hero. The hero might be an off-the-charts genius but then the heroine needs street smarts in her arsenal to go toe-to-toe with him. If the trickster hero has hoodwinked the heroine then she must have the ability to outwit him as well. The romance hero can be smarter than the heroine but he can’t continue to dupe her. In my opinion, a romance heroine doesn’t have to be sharp and clever, but she does have to challenge the hero and keep him on his toes. Even if he manages to outmaneuver her, she doesn’t let it happen again and she will always command the hero’s respect.